We are pleased to offer Engineering International Scholarships 2017 to all international undergraduate students starting their studies in the Faculty of Engineering in September 2017. Computer Science, Electronic & Electrical Engineering, Materials Science and Engineering, Mechanical Engineering, MEng Engineering. This excludes any years in industry or study abroad periods. 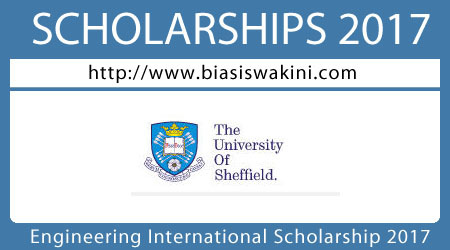 - The scholarship will not be awarded where partial funding is applicable from an external body* and there is an agreement already in place between the external body and the University of Sheffield to offer a tuition fee discount to the student. * Government or governmental organisation – international, national or regional; research council; charity; private enterprise; or any similar organisation. 0 Komentar untuk "Engineering International Scholarship 2017"